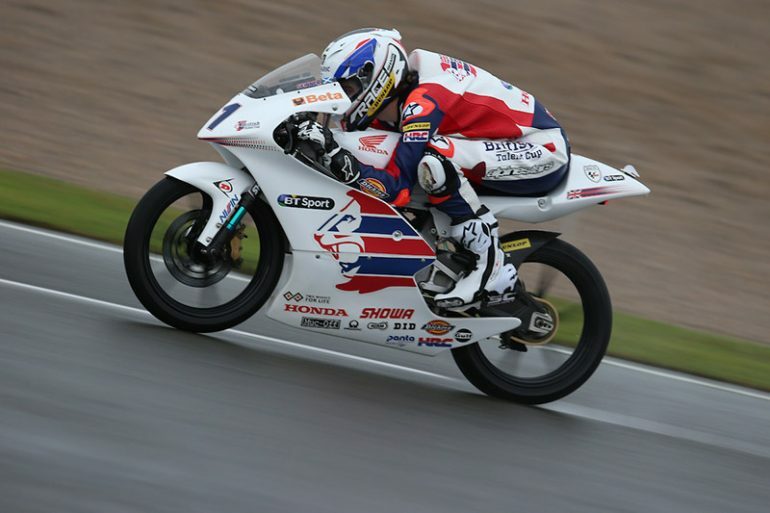 Rory Skinner gave a mature performance to finish second in tricky conditions at the penultimate round of the British Talent Cup, held at the Valencia circuit in Spain, to extend his championship lead to 24 points ahead of tomorrow’s final race. Coming to the Spanish track with a 12 point advantage, the 17-year-old Scot qualified on pole position in the morning’s soaking qualifying session, ahead of title rival Thomas Strudwick. Strudwick took an early lead, with Rory feeling his way in second, but the English rider crashed on lap four to end his chance of becoming the inaugural British Talent Cup champion. That left Rory in the lead, but with a championship at stake the Scot rode within his limits as Max Cook pushed on to catch and pass Skinner to take the win. Rory finished 12 seconds ahead of the battle for third, in a race in which just 10 riders finished. Rory’s 20 point haul means he now needs to finish 14thor better tomorrow to secure the title in tomorrow’s 17-lap race, which takes place after qualifying for the final MotoGP world championship races of the season.